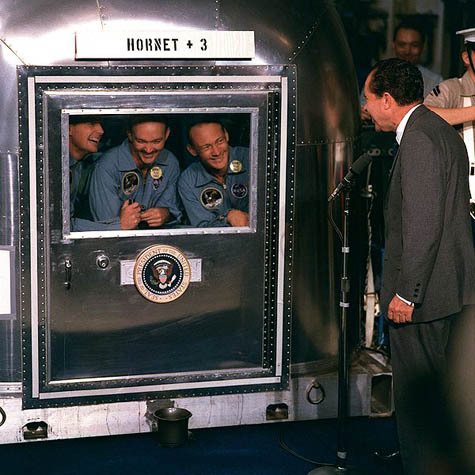 [Image: President Nixon addresses quarantined astronauts from the Apollo program; via NASA]. I'm incredibly excited to announce not only that BLDGBLOG will be living in New York City this fall, but that my wife and I will be hosting a design studio there called Landscapes of Quarantine – the results of which will be the subject of a public exhibition at Storefront for Art and Architecture in early 2010. Meeting one evening a week this autumn in Manhattan, from October 6 to December 5, 2009, up to 14 studio participants will discuss the spatial implications of quarantine, each developing an individual design project in response to the studio theme. Quarantine is both an ancient spatial practice and a state of monitored isolation, dating back at least to the Black Death – if not to Christ's 40 days in the desert – yet it has re-emerged today as an issue of urgent biological, political, and even architectural importance in an era of global tourism and flu pandemics. [Image: "Fear of Flu" by Mike Licht]. Quarantine touches on serious constitutional issues associated with involuntary medical isolation, as well as on questions of governmental authority, regional jurisdiction, and the limits of inter-state cooperation. Quarantine is as much a matter of national security, public safety, and agricultural biodiversity as it is an entry point into discussions of race, purity, and unacknowledged discrimination. Quarantine is also a plot device increasingly seen in novels and films – from the aptly named Quarantine and Albert Camus's The Plague to I Am Legend and The Last Town on Earth – even as it has become a source of arcane technical debate within plans for Martian exploration and Antarctic drilling rights. The design implications of quarantine stretch from the ballast water of ships to the way we shape our cities, from the clothes in travelers' suitcases to stray seeds stuck in the boot treads of hikers. 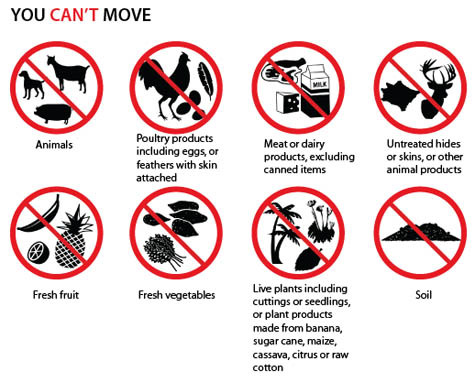 Quarantine affects the pets we keep, the programs we download, and the machines we use in food-processing warehouses, worldwide. Quarantine is about managing perimeters, controlling influence, and stopping contamination. [Image: Cages for the laboratory testing of rats and mice by Innovive]. So how do we treat quarantine as a design problem? Whether we design something to demonstrate that the very notion of quarantine might not be possible; whether we produce actionable plans for quarantine units, ready for implementation by the World Health Organization in hot zones around the world; whether we create quarantine-themed graphic novels, barrier-based urban games, or a series of ironic public health posters to be mounted around the city, how can we design for quarantine? Quarantine also offers fertile territory for investigation through cartography and cultural documentation. After all, if we mapped the contents and locations of quarantine facilities worldwide, designed infographics to analyze the spread of invasive species, or recorded the oral histories of the quarantined, what sorts of issues might we uncover? Bringing these very different techniques, media, and approaches together in the confines of a dedicated design studio will give participants an exciting opportunity to explore the overlooked spatial implications of quarantine. [Image: A poster for Quarantine, directed by John Erick Dowdle]. We have already confirmed a fantastic list of participants, whose backgrounds include architecture, photography, illustration, games design, sound, landscape, food, and more; we are now opening the studio to a general call for interested participants. The brief – which you can download here as a PDF or that you read as a JPG on Flickr – explains more; but potential applicants will be working with a truly stellar group as they meet once a week this fall and produce work eligible for inclusion in the "Landscapes of Quarantine" exhibition to be held at Storefront for Art and Architecture in early 2010. If you are interested, please download the brief – which includes all necessary application info – and contact us at futureplural @ gmail by September 19, 2009. Landscapes of Quarantine is an independent, multi-disciplinary design studio, based in New York City, consisting of eight Tuesday evening workshops, from October 6 to December 5, 2009, in which up to 14 participants will gather to discuss the spatial implications of quarantine. Quarantine is an ancient spatial practice characterized by a state of enforced immobility, decontamination, and sequestration; yet it is increasingly relevant—and difficult to monitor—in an era of global trade, bio-engineering, and mass tourism. Studio participants will explore a wide variety of spatial and historical examples, including airport quarantine facilities, Level 5 biohazard wards, invasive species, agricultural regulations, swine-flu infected tourists confined to their hotel rooms, lawsuits over citizens' rights to resist involuntary quarantine, horror films, World Health Organization plans for controlling the spread of pandemics, lunar soil samples, and more. During the studio, participants will develop individual design projects in response to the problem of quarantine, with guidance and inspiration provided by readings, screenings, group discussions, and an evolving line-up of guest speakers and critics. These projects will then be eligible for inclusion in "Landscapes of Quarantine,” an exhibition hosted by the internationally renowned Storefront for Art and Architecture in early 2010. By the end of the studio, each participant will have produced a complete design project. This could range from the speculative (plug-in biosecurity rooms for the American suburbs) to the documentary (recording the items and animals detained for quarantine on the U.S./Mexico border), and from the fantastical (plans for extra-planetary quarantine facilities) to the instructional (a field guide to invasive species control). Landscapes of Quarantine is looking for applicants who are intrigued by the spatial possibilities and contingencies of quarantine, and who already possess the technical skills necessary to produce an exhibition-quality final design project or installation in their chosen medium. We hope to hear from people at all stages of their careers—from graduate school to retirees—and from a wide variety of design backgrounds. We are particularly excited to announce that we have already confirmed a select group of talented participants from fields as diverse as architecture, illustration, gaming, photography, and sound design. The studio is both unaffiliated and independent (there is no college credit), and it is also free (though applicants will be responsible for all costs associated with producing their final project). We will be reviewing applications on a rolling basis until Friday, September 18, 2009, or until all studio positions have been filled. To learn more, and to submit an application, please email futureplural @ gmail with the information listed below. Landscapes of Quarantine is produced and organized by Future Plural, a project-based, independent design lab launching in October 2009 from a temporary base in New York City. Future Plural is Geoff Manaugh (BLDGBLOG) and Nicola Twilley (Edible Geography). Finally, a major motivation behind starting Future Plural and hosting the Landscapes of Quarantine studio is to found a new institution without permanent location, dependence on grants, or academic affiliation. After all, as bloggers, why can't we create our own groups, faculties, cultural spaces, and more? By bringing people together, on a project-by-project basis, to explore ideas and issues in a cross-disciplinary environment, we hope to demonstrate that, even in a time of recession, there is a broadly shared enthusiasm for creating something new. Here is an article that raises some rather interesting questions regarding the implications of abnormal confinement on the mutation, incubation, and spread of infections. On a separate note, the concept of quarantine is particularly illustrative when considering the "toxic" assets quarantined by the Federal Reserve and the notion of quarantining information pertaining to the solvency of financial institutions. This brings to mind the fraudulent practice of keeping two sets of (quarantined) books, as well as the unofficial quarantining of certain real estate markets from obtaining credit by "redlining". The practice of quarantining is especially interesting and potent since it's practiced by the powerful to protect their interests from things as far ranging as; counterfeit goods, non-union workers, or even undesirable political views by employing "gatekeeper" media and party structures. Okay, I guess there's only one thing, or I forgot the other thing. But if this is anything like Cockatoo Island, I'll definitely look forward to the resultant board games. Have you read Jim Crace's Quarantine? It's weird, but very good (IMO). Whitbread winner. Anyone interested in the farthest extremes of the concept needs to read Greg Egan's 1992 novel Quarantine. It's mind-bending science fiction at its hardest. What happens if the coherence of the quantum wave function that allows a "particle" to be in two places at once could be extended to a whole person? That person could walk through walls, providing a solution to the famous locked room mystery that has driven thousands of detective stories. How do you quarantine a person with such abilities? Maybe a species that could develop such individuals needs quarantining itself? Detective Nick Stavrianos is engaged to find a mentally disabled girl who vanished from her locked hospital room, and discovers something far more world-shaking. this is great. one more reference i'd like to add over here: 'blindness' by jose saramago. don't watch the movie, although it's entertaining - it killed my imagination. it's fun since in blindness quarantine space, the environment really is reduced to bare essentials. This sounds fantastic. I certainly hope you can be involved in some way with my education as an architect (when I finally get to M.arch school...). this looks set to be even pointless than the sydney one. hopefully you design some buildings this time. architecture is a real thing. which actually exists. its not a pimply sci-fi back patting excercise between you and your mundane coterie of brain-dead scenesters. this blog is the most insipid work of any kind of writing, apparently architectural or otherwise i have read in a reasonable period of time - containing the most fully sick new caves you have seen geoff........ and i am counting the seconds until you censor this comment from your bucketfulls (or should i say tunnel-fulls) of praise. Angry doubleposting troll is angry! Thanks, anonymous; it's particularly hard to be insulted by someone who writes really well. Algosome, I haven't yet read the Egan novel, but will definitely try to get to it this fall. JTG, your comment is financing and brings a whole other side of quarantine into the picture; I need to look into this! Thanks for the suggested direction. Joe, we'll be meeting in a fairly small space, I'm afraid, so non-participants simply wouldn't fit in the room! But Nicky and I will be using our respective blogs—while not writing about tunnels, of course—to report back on the conversations, guest talks, ongoing projects, and more. And, Clare, the Crace book has a hugely interesting interpretive take on quarantine—we'll be mentioning it during the studio. Thanks for the comments and feedbacks so far! And expert a few more updates soon, including an announcement of studio participants. District 9, the upcoming Peter Jackson film set in South Africa about a alien species kept (not entirely successfully) quarantined in a slum in Johannesburg, promises to be an interesting investigation of the subject. Many thanks to the hosts of this remarkable exploration. I hope that the fruits of your fascinating program will be recorded in such a way that those of us who are not in NY can fully experience them! Reading your brief made me realize that quarantine may have a far greater influence that I ever gave it credit for. The first example that springs to my mind is the Hausmannization of Paris. Widely seen as an urban beautification program, it was also a military response and quarantine against the poor. Just a few years before, the armed forces had great difficulty suppressing the revolution of 1848 along too many narrow streets. The destruction of those streets and construction of grand, sweeping avenues served imperial military purposes, while displacing and expelling the poor. Those old, tall, skinny, crooked buildings that so famously housed shops at ground level, merchants above, perhaps a middle class family above them, and a penniless artist in the attic, were replaced by economic homogenization. The less well-off were not welcome in Hausmann’s dream city. I believe this quarantine, or social exclusion, had profound political ramifications in the future of that city and is relevant to the present day. I look forward to seeing how quarantine is investigated by your group and understanding more about the implications of this important subject.